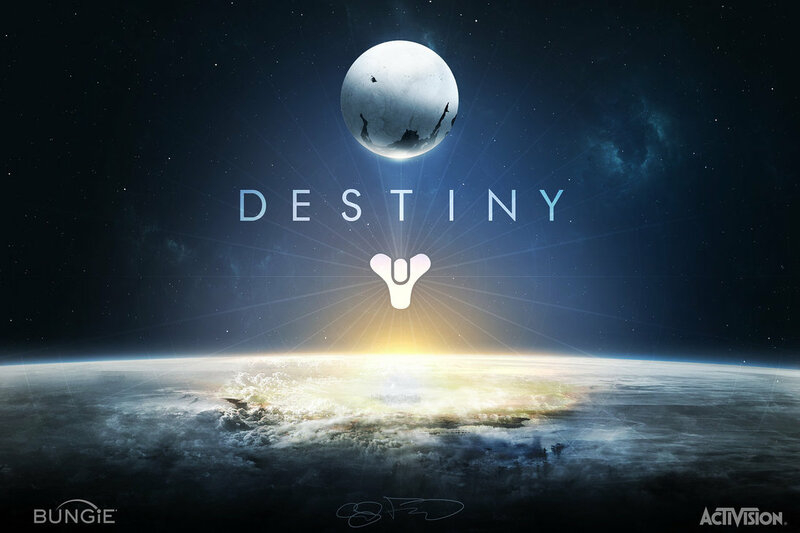 Bungie, the creators of the ‘Halo’ and ‘Call of Duty’ franchises have teamed up to bring us a new adventure: Destiny. The premise of Destiny is that an asteroid type thing called ‘The Traveler’ entered our galaxy and ‘landed’ on Earth prior to the game. For a while, everyone on Earth lived longer and stronger and what have you. However, for every good in the universe there is an equal evil, in this case called ‘The Darkness’. The Darkness followed the Traveler and has been attacking all of our planets for hundreds of years by the beginning of the game. Humanity has nearly been wiped out, and everyone left on Earth lives somewhere in Russia called ‘The Last City’. Just outside the city is a place called a Cosmodrome, which used to house a lot of research and weapons stuff, but is now just a wasteland. This is where your character starts, when you are discovered by a ‘Ghost’. The Ghosts are hard to describe. They look like little floating metal things that can scan objects and gain information, but they are also very much like the AIs from the Halo franchise. Each Ghost has a ‘Guardian’ – You – and it.. well it essentially possesses you and acts as your guide. Basically it’s your own version of Cortana if you’ve ever played Halo. For those of you that haven’t it’s like if your Google Glass were hooked up to your brain and could talk to you, I guess. Anyway, the Ghosts were created by the Traveler during the last stand (which was who knows how long ago). The Traveler now only has enough power to protect The Last City, which includes a special tower just for Guardians. As a Guardian, it is your job to push back the Darkness. At the tower, the game switches from first-person to third-person, and you can buy items to re-equip your character, from armor and weapons to space ships. The Tower is also a meeting place for everyone who is playing the game. You can meet new players and build your Fireteam here. Guardians remind me a lot of Spartans from Halo as well, but without all the fancy armor. The Guardians can be one of three different classes: Hunters (a Ranger), Titans (the generic Fighter), and or a Warlock (your basic everyday sorcerer). I chose to be a Warlock. The only differences between the classes are their melee attack (a ball of power versus a knife) and their special attacks (again, magic versus an actual item). The levels are relatively straight forward with your Ghost directing you through the Cosmodrome wasteland and killing ‘The Fallen’ (much like the Covenant in Halo), who are considered precursors of the Darkness (which I guess abated for a while and now is back). At the end of each level you end up in a rather large area with lots of monsters and usually a boss that is blocking whatever item you are trying to get. The second level puts you in a large, well-lit area, while the third level puts you in complete darkness with only your flashlight to see by. Needless to say, I didn’t get past level three. In total, the Beta version allows you to access around 5-6 levels including the special level that was only open Saturday afternoon/evening. Once your character level reaches 5, you also gain access to ‘The Crucible’, also known as Multiplayer Mode. My brother made it this far and then let me play on his profile so I could get a feel for it. The game features much the same controls as the Halo games, but has the addition of taunts – things your character can do in the game like pointing, waving, dancing, and sitting down. Now why would a First-Person Shooter Game have taunts, you ask? Because it’s not exclusively a single player game. Every level can be played co-operatively with 1-3 other players, and you can make sure those players are your friends by adding them to your ‘Fireteam’, much like the teams in Halo 4’s multiplayer mode. I would compare these things to Call of Duty as well, but I don’t have nearly enough experience with that game series to do so. Without further ado, let’s get on with the review! I was so-so about the character building. Once you pick you class, you have to pick your race: Human, Awoken, or Exo. Humans are normal, duh. Awoken are super pale, almost blue-looking with eyes almost like those in the movie ‘The Host’. I think they’re supposed to Alien-type people, maybe from Mars or Venus, since those are the two planets that are the most Earth-like in this game. The Exo I would call the Cyborg-Robot type people. I chose Human just to be generic. You can then customize face and coloring. The things that disappointed me about the character building was the lack of diversity in facial choices, and the lack of description for the Awoken and Exo races. I rather wonder if they made some of the levels so difficult because it is MEANT to be played as a co-op. I played the special level on Saturday with two of my brother’s friends and it was infinitely easier than I was finding level three to be, which strikes me as odd. I liked that each level had a general layout, but I hated how small of an area your flashlight lit up (granted I’m also the person who hates scary movies). I was rather surprised that the levels required so much strategy so early on in the game, but I think it was pretty cool. There is definitely some sort of understanding with the creators of the game that you have played Halo or Call of Duty before, since they never explained how to shoot or zoom with your gun, and you were just expected to know how. The Crucible is intense. The only gameplay type available during the Beta testing is ‘Control’, which features three zones (A,B, and C) which you stand in for a set amount of time in order for it to change color and be controlled by your team. In order to steal a zone from the opposing team, you have to stand in the zone twice as long: half to undo the other team’s control and make it neutral, and half to make it yours. Teams are made up of 6 players and you bring in your own weapons. most special powers don’t work in multiplayer, which evens out the playing field a little. What I didn’t like about multiplayer mode was that the weapons are so powerful (Even at the level cap of level 8) that one or two hits with any weapon, even a pistol, would kill a player. The other problem I had was that every zone you needed to capture was always around a sharp turn, and there was only one way into each zone. This created the issue of the team who controlled the zone being able to see everyone coming at them, but those trying to capture the zone couldn’t even see the zone before they were killed. It angered a lot of people and players kept quitting out of frustration. Even if everything was a bit on the difficult side as far as the first few levels of a game go, it IS only a beta test. The coolest thing about this beta test though, and reason I really wanted to write this review, was the marketing strategy that Bungie (the company behind Halo and the one releasing Destiny) used and is using. The game’s release date is set for September 9th. Bungie opened it up for pre-sale about 2-3 weeks before the beta test was scheduled to happen. When people pre-ordered the game, they were put onto a list for access to the beta testing. The game is being released on not one, not two, but FOUR different consoles: PS3, PS4, Xbox 360, and Xbox One. Sunday night of beta test week, they sent the PS3 and PS4 their codes. Players on those consoles got to play first. On Tuesday night, they sent the Xbox 360 and Xbox One players their codes. Starting Wednesday, the Xbox players could play too. But that’s not all. When the players received their codes, they found out that they got not only one code, but THREE codes, so they could give the extra two to their friends who hadn’t pre-ordered the game yet. Then, on Friday, Bungie opened up the beta testing to anyone with a console, and they started to live-stream their own teams playing the game online, so even if you weren’t participating the beta test, you could still see how the game worked. Now, the point of a beta test is for players to find faults in the game and to test the server strength. The Halo and Call of Duty game’s multiplayer modes are often overwhelmed and crash, so Bungie wanted to run the ultimate test to make sure that Destiny’s servers wouldn’t crash the same way. When they systematically opened the servers up to more and more players, they were really testing the strength of the servers. But even after they opened it up to everyone, there was no guarantee that they would get enough people playing at the same time to fully test the capacity of the server. Enter the most genius idea ever. Bungie released a special mission (and an achievement award, to be issued when the game officially releases) for JUST Saturday afternoon at 2 PM Pacific, 5 PM Eastern time for a couple hours. This ensured that EVERYONE would be online, playing Destiny, within a few hours’ time frame. It was crazy. BUT, the servers did not crash. I applaud the team at Bungie for coming up with this ingenious idea and for sticking to it. You have made a great many gamers incredibly happy, and a great number of marketers insanely jealous that you could pull off something like this beta test, with all its different components, in so short a time period. I salute you. Did you participate in the Destiny Beta Test? What did like/dislike about it? Let me know on Twitter @Ladywoods13.